Since 2008, I’ve been looking at all the poetry books published in New Zealand each year and reporting on the gender balance. That first year, a little over a third (36%) of the poetry books published were by female authors, but there has been significant change over the five year period and women are now responsible for almost half (47%) of NZ poetry books. Here is a graph showing how things have changed. Another way of looking at it is that men (green in the graphs) were getting almost two thirds of the poetry publishing pie in 2008 and this was down to just over half in 2012 (mmm – pie). Now, I don’t know the ethnicity of all the poets published in 2012, but out of the 55 poetry books published, I only noticed one that I know was written by a Māori poet, two written by Pasifika poets and none by Asian poets. So what’s with that? There are obviously plenty of Māori poets, as evidenced by AUP’s Puna Wai Korero – An Anthology of Māori Poetry in English. I look forward to seeing a body of poetry that better reflects our population make-up. What is perhaps most alarming about the trends over the past few years is how few poetry books were published in 2012 – 55, compared with 88 in 2008. 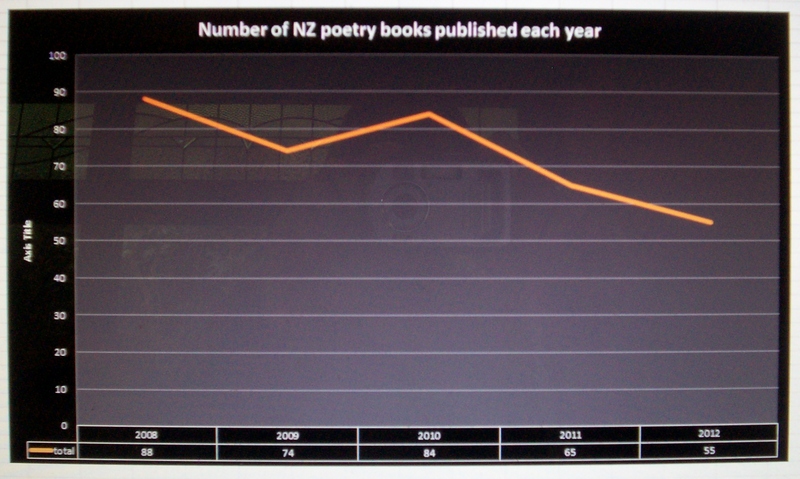 The three main publishers of poetry in New Zealand remain Steele Roberts (13 titles in 2012, similar to the 12 published in 2008), Victoria University Press (12 titles in 2012 compared with 6 in 2008) and Auckland University Press (5 titles in 2012 compared with 8 in 2008). My source, as usual, is The Journal of Commonwealth Literature ( December 2013 48: 541–553, Kirstine Moffat and Larissa Schumacher). The list includes a handful of books by New Zealand poets that were published in other countries. Thanks to Rebecca Pilcher for helping me source the latest information. News in Brief: the boys are still winning; the girls haven’t yet caught up. Since 2008, I’ve been looking at the Journal of Commonwealth Literature’s annual summary of what was published in New Zealand the previous year. Despite a general perception that more female poets are being published here, it’s actually the other way around. 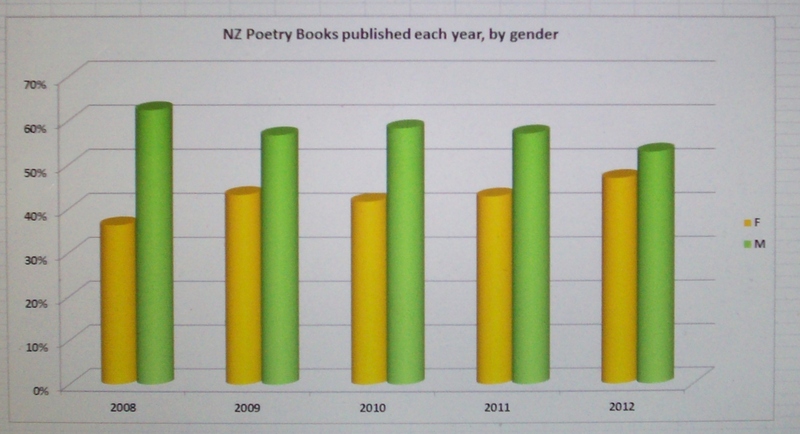 Here’s a little table showing that, in each year since 2008, male poets account for around six in every ten poetry books published in New Zealand; female poets for about four. Where it gets interesting, is breaking the books into those published by “larger” poetry publishers (and in here I’ve included AUP, VUP, Steele Roberts & Random House – who put out Hone Tuwhare’s collection in 2011) and those published by smaller presses (such as Headworx, Seraph Press, Titus and Earl of Seacliffe). Women outnumber men at the larger presses (18 female poets and 15 male poets in 2011), while men outnumber women at the smaller presses (9 female poets and 22 male poets in 2011 + one person I couldn’t put into a gender box from their initials). So that probably explains why people have a sense that more women are being published. It would be interesting to look at sales figures too. Disclaimer: I haven’t checked all the books listed by the Journal of Commonwealth Literature, but I did notice they had included at least one novel on their list of poetry books (which I omitted from the analysis) – Mark Stephenson’s No Second Chance. 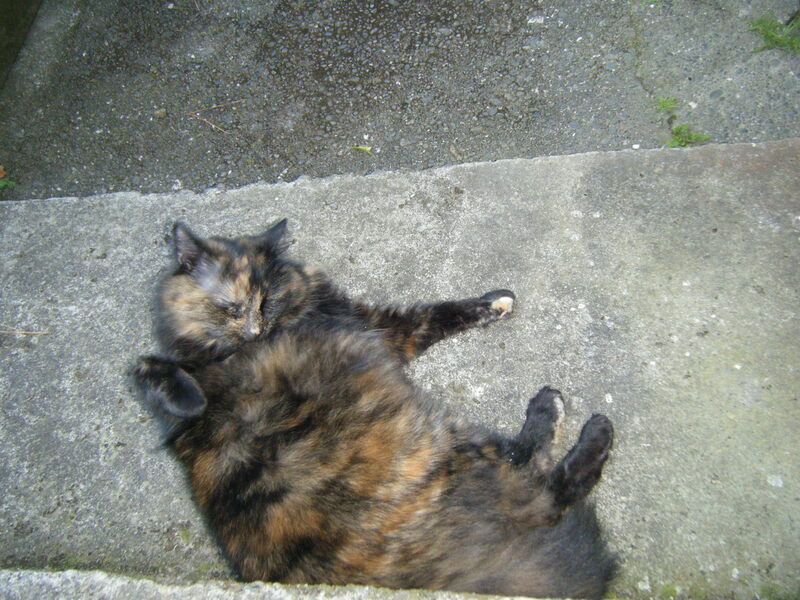 And because this is the internet, here is a picture of a cat.